SPECTREOUTREACH.com: LITTLE THINGS TO COOL DOWN THE HELL FIRE! LITTLE THINGS TO COOL DOWN THE HELL FIRE! Wait a minute, that would be to easy for me. Hmmmmm! i know how about "The Suzukaze (Cool Breeze) seat cushion is the latest personal air conditioning from Japan’s Kuchofuku, maker of air-conditioned beds and clothes. 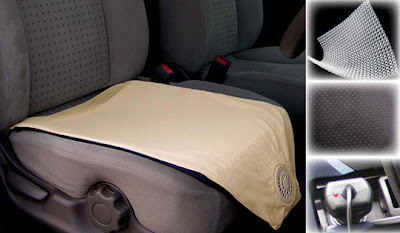 Using new materials and energy-saving fans, Suzukaze cools you in your seat without being power hungry or noisy." It sound like a cool device for the DemonLord to cool his bottom and the rest of the nuffnang blogger since blogging can be hell-rising thing! Sample picture to tell you how it works! Tune down the Demon heat as you listen to any boring presentation! Perfect cooldown while you are stuck at your car!